The choirs of St. Luke’s are indeed the “soul” of the church’s music ministry, enlivening worship through song. Every Sunday, the Parish Choir, for adults and teenagers, provides music for all 10 o'clock services from September through mid-June, singing music for soprano, alto, tenor and bass voices from all musical eras from medieval times through the present day. Highlights from the last two seasons include performances of selections from Fauré’s Requiem, Mozart’s Missa Brevis in F, K. 192, Haydn’s Creation, as well as works by J.S. Bach, John Rutter, Ralph Vaughan Williams, Felix Mendelssohn, Moses Hogan, and artful arrangements and newly composed pieces by a wide variety of contemporary composers. The children’s choir, which rehearses weekly after the 10 o’clock service, performs two musicals a year and provides additional music approximately once a month throughout the church year. During the last two years, the children’s choir has presented traditional Christmas pageants––complete with costumes, carols, and participation from Sunday school kids of all ages––as well as spring musicals. In 2017, inspired by several songs of Kathie Hill, choir director Kate Weber-Petrova wrote a new script called Fishers of Men: The Musical to be performed with several of Hill’s songs. Fishers of Men encourages children to engage with biblical stories, embrace evangelism, and contemplate God’s presence in the ordinary moments of life. In 2018, the kids premiered another script written for them by Kate, Praise Him with a New Song! A Musical about Cecil Frances Alexander, Martin Luther, and Francis of Assisi. In this script, the children learned about three influential Christian hymnwriters, their lives and hymns, and the ways in which they helped the world to be a better place. To see the children’s choir in action, please watch the video below of the 2018 children’s Christmas pageant. Both choirs are under the direction of Kate Weber-Petrova, organist and choirmaster, who also plays "Cecilia," St. Luke’s magnificent Visser pipe organ. 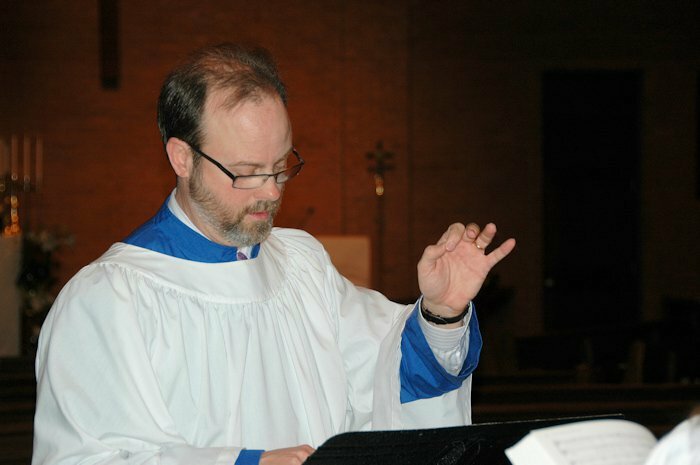 In addition to our vocal ensembles, St. Luke’s has a number of talented professional and amateur musicians who contribute regularly to worship, and has sometimes presented hand-bell music on special occasions throughout the church year. If you have an interest in any of these ensembles or the music program in general, please contact the music director at KateWP@saintlukeschurch.net.